Named in honor of film director James Bridges (The China Syndrome, 1979), the theater is one of the outstanding screening venues in Southern California, due to the generous support of the filmmaker’s partner, actor Jack Larson and the Bridges/Larson Foundation. The 278-seat theater was completely renovated in 2003 with a state of the art sound system and is one of the few theaters in the U.S. that can accommodate both nitrate and safety film stock in 16mm, 35mm and 70mm, as well as a variety of video formats, including the latest in 4K digital projection. Download the Theater's technical specifications. For rental inquiries, please contact Karl Holmes at (310) 206-8111 or by email at kholmes@tft.ucla.edu. 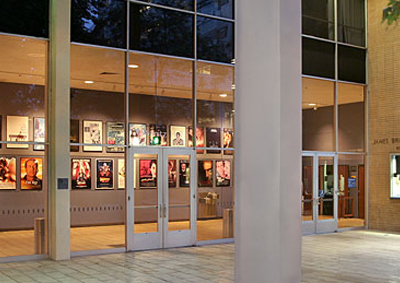 The James Bridges Theater is situated on the northeast corner of the UCLA campus in Westwood, adjacent to the Broad Art Center and the Murphy Sculpture Garden. Pay-by-space parking is $3 per hour, up to $12 (all day).